In putting together our homeschooling classroom, we tried to use pieces we already had. For our work table we're using our IKEA Docksta table. But we definitely need some chairs. My boys don't mind sitting on their knees, but it's definitley not promoting a good work posture. 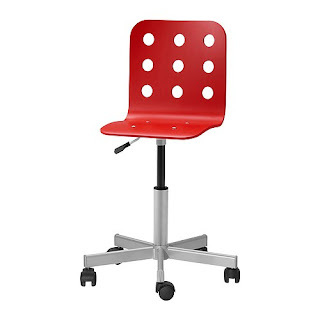 I love the Junior JULES chairs. They are the perfect combination of function and fashion. They look fabulous, can easily grow with your child into their teen years and so practical with the swivel base and adjustable height. I've been scouring Craigslist for one of the these beauties or I may just bite the bullet and pay the $34.99 for it. :) Still a great deal. All for now. Have a great weekend! See you Monday!